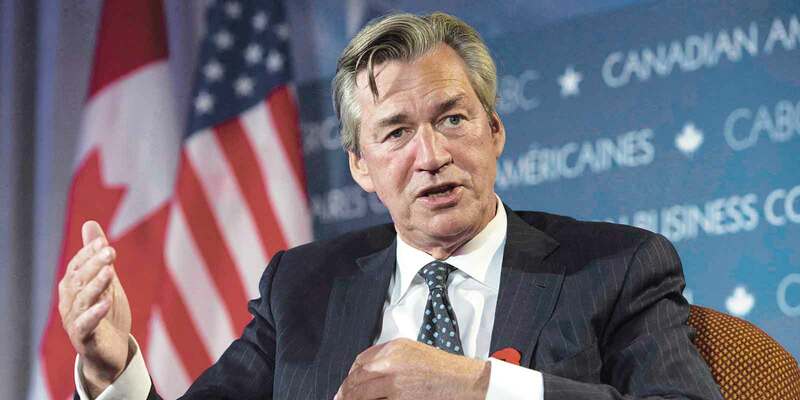 Former Canadian ambassador to the United States Gary Doer on cross-border trade, energy policy, and ‘bumper sticker politics’. PHOTO CREDIT: THE CANADIAN PRESS / JUSTIN TANG. Gary Doer is no stranger to the public spotlight. Heralded as a consensus builder by those of seemingly every political stripe, his résumé is among the most decorated in the country: Provincial cabinet minister, leader of the opposition, three terms as premier of Manitoba, and more than six years as Canada’s Ambassador to the United States. Since returning to Winnipeg from Washington this past January, however, Doer has been enjoying life free from underneath the microscope. He has joined five boards of directors, including Investors Group and Great West Life, and sits as co-chair of the Canada Institute at the D.C.-based Woodrow Wilson International Center for Scholars. It is a change of pace that has allowed the 68-year-old to remain connected to one of his true passions and an issue that has become a hallmark of his career: Canada-U.S. trade. Amidst one of the most contentious presidential election campaigns in recent memory, international trade has been embroiled at the centre of the U.S. debate. But strangely absent from much of the discourse has been America’s largest customer and — notwithstanding the European Union — it’s most significant source of imports. In 2015, Canada purchased $337 billion USD in goods and services from its neighbour south of the border — more than any other nation, including all 28 countries comprising the E.U. Canadian exports to the U.S., meanwhile, topped more than $325 billion USD. Perhaps the only context in which the world’s largest trading relationship has received meaningful attention has come while debating the merits of NAFTA — signed in 1993 by then-president Bill Clinton. And although Mexico remains prominently in the crosshairs of NAFTA discontent, Canada hasn’t been able to escape the widespread frustration felt across many hard-hit industrial states. It’s a narrative, Doer believes, must change. Many Western Canadians called on Doer to ask that very question following President Obama’s decision to reject the proposed Keystone XL pipeline this past November, capping a turbulent, seven-year saga that would’ve delivered crude from Alberta’s oil sands to specialized refineries 2,500 kilometres away along the Texas Gulf Coast. As ambassador, Doer was a vocal champion for the pipeline’s approval. He sharply criticized lawmakers for not considering the safety implications of moving oil by rail or truck as opposed to pipelines, and saw it as a missed opportunity to tackle North American energy security. But, as he points out, that doesn’t mean there hasn’t been progress. Under President Obama, the United States has increased its Canadian oil imports by 1.4 million barrels — double the 700,000-barrel-increase managed by the administration of George W. Bush. The future of energy policy, he suggests, is a cooperative strategy between the two countries addressing both consumer demand and climate change. Each presents a unique challenge, yet neither can be solved individually. One major hurdle in developing a joint energy framework is regulatory reform. Methane emissions standards, for instance, which are a by-product of oil and gas exploration, differ substantively on either side of the 49th Parallel. This becomes particularly problematic in shared economic regions such as the Bakken oil play, where 275,000 tons of methane — about two per cent of the global total — are emitted each year. The lucrative basin straddles the borders of Saskatchewan, Manitoba, Montana, and North Dakota, placing stricter rules on Canadian companies than their American counterparts. Of course, the energy sector is not alone in its irritation. The food industry has long battled regulatory inconsistencies, such as country of origin labelling. Even a product as simple as soup is subject to different container size requirements in Canada and its southern neighbour, making it cost prohibitive to export from one country to the other. The good news is all parties seem committed to walking the path of harmonization — albeit slowly. Initiatives such as the Beyond the Border Action Plan and Regulatory Cooperation Council are intended to reduce variation and overlap, simplify requirements, and minimize the cost of compliance. Vehicle emissions standards are a case study for how these efforts can lead to stronger business outcomes. Due to the highly integrated nature of the vehicle manufacturing supply chain (a car can cross the border up to seven times before reaching saleable condition), consistency was a core priority of environmental regulators in the early 2000s. The result was better greenhouse gas performance — and increased car sales. Not all regulatory reforms are as high profile. Some barely make it onto the public radar. Another burr in the saddle of the Canada-U.S. trade relationship has been the export of softwood lumber. At the heart of this dispute have been Canadian stumpage fees — public levies charged to harvest timber, most of which is government-owned. The United States claims, because the price is not set in the competitive marketplace, the fees amount to unfair subsidization and a violation of trade rules. It is an issue Doer knows well. He was part of the team that negotiated the last extension, which expired in October 2015. And while Doer remains optimistic a new deal can eventually be reached, he warns getting there may be a rocky road. “There are three main challenges Canada will have in these negotiations,” he says. “The first is that we won all four arbitration cases under the previous agreement, including a big one on pine beetle wood, so the Americans will likely ask to change the dispute resolution mechanisms. “The second issue is going to be the dollar. It’s easier to have the argument surrounding levelling the playing field when our dollar is higher and the two currencies are closer together. The United States currently accounts for more than two-thirds of Canada’s softwood lumber exports. 2016 may very well be remembered as the year of nationalism. In the first six months alone, concerns over immigration and the euro drove Brits to ‘Brexit’ the E.U., and the U.S. election stoked unprecedented calls to rip up trade agreements and thicken borders. Then again, for Prairie manufacturers, U.S. protectionism is nothing new. Buy America provisions have been sprouting up in legislation for years. Yet, Doer says a compelling sales pitch, paired with diligence, can be an instrumental tool to ensure Canadian companies retain market access. U.S. ire, though, has not been limited to Canada. The Trans-Pacific Partnership (TPP) — a pending, 12-nation agreement touted as the benchmark for 21st century trade pacts — has played the role of political football thus far in the American election cycle. Even Democratic Party candidate Hilary Clinton, who negotiated TPP while serving as Secretary of State, has reversed course on whether she will support implementation. But, according to Doer, don’t close the book on TPP just yet. In many ways, Canada is at the mercy of the U.S. on TPP. The agreement cannot come into force unless backed by members comprising 85 per of the collective gross domestic product — a not-so-well-veiled implication that, if the U.S. or Japan back out, the deal is dead. It would be a tough pill to swallow, remarks Doer, but not a catastrophic blow to Canadian trade. “If you get a mere two per cent increase in trade to the U.S. and a 10 per cent increase to any country in Asia, including China (which is not a part of TPP negotiations), the two per cent is still dramatically more beneficial to the Canadian economy because of volumes,” says Doer.